I start my thoughts on the very lively new tripartite exhibition in Sydney – The National 2019 – on a sad note....the death of Mumu Mike Williams, the great artist/politician from Mimili Maku art centre in the APY Lands. His heart attack at the depressingly youthful age of 56 came at just about the peak of his career – commissioned to make his largest ever work for The National, and a 240-page bilingual book delivered to the publishers full of his life and stories, and intended for reading by every school in Australia. It comes out from Allen & Unwin in August. 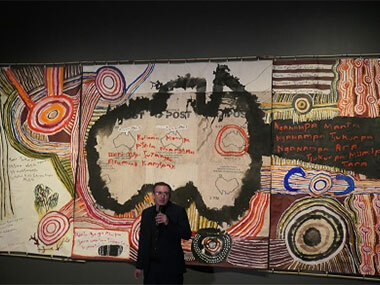 The large painting, boldly entitled 'Kamantaku Tjukurpa wiya' (The Government Doesn't have Tjukurpa/Dreaming), maintains his theme of the last five years in which old Australia Post bags have been illegally repurposed as canvases slung from desert spears, with Pitjantjatjara imprecations added. For his magnum opus, though, Mr Williams has also added the symbols of his Tjukurpa in the form of Dreaming places, routes between them, spears – so important in the APY elders' efforts to get their young men engaged with the culture – and even some landscape. “Black skinned Aboriginal people have always had powerful Tjukurpa Dreaming law and have passed it down through generations since time began. The government simply cannot claim ownership of this land and must never destroy cultural heritage sites. The shame of it. Do not destroy sacred sites or dig up the land around them. Listen, if you come here, you must accept that the law of our land is under the control of our senior men. Do not plan to build roads in the vicinity of sacred sites, because of the risk of destroying Tjukurpa. The government doesn’t have Tjukurpa. This is our land. Our Tjukurpa. Our cultural heritage. Our Tjukurpa is sacred”. “The use of the mailbags”, explained Mimili Maku coordinator Anna Wattler, “was Mike's way of sending a message back to the government. For the Post Office was also the rations depot where strychnine-laced flour was delivered to Anangu”. At Sydney's Museum of Contemporary Art, Wattler was accompanied by Mr Williams's widow, fellow-artist Tuppy Goodwin – and they both had wonderful works in last year's NATSIAAs. The coordinator continued, “Mike set out to write a 40 page book – but he's had such a rich life as a stockman, carpenter, ngangkari and Christian pastor, as well as being active in the APY Land Rights movement that led to the signing of the Pitjantjatjara Land Rights Act in 1981 and the return of land to Anangu, it just grew and grew to 120 pages; double that when translated”. As Mimili Maku's tribute to Kunmanara Williams puts it, “In his art practice, he addressed issues including governance, sustainable land management, the protection of sacred heritage sites, and the rights of traditional owners”. And some people think urban Aboriginal artists are the only political ones! It's hardly surprising that the MCA should have chosen 9 of the 19 Indigenous artists selected for 'The National'. For Clothilde Bullen – a Noongar Yamatji woman from the West – is the only Aboriginal curator involved. She was very excited that connections were thus being made with non-Indigenous artists - “It's all too rare that they're shown together in what we're calling this 'Third Space'”, she assessed. And she's certainly chosen the strongest urban works – the multiple raku pottery pieces of Janet Fieldhouse, each augmented by objects from nature such as feathers and bones. I might also argue that in an admittedly limited field, she's also obtained the strongest paintings in the whole show. Does anyone paint skilfully these days? It's barely apparent amongst this collection of 70 artists (aged from 29 to 72) who represent the zeitgeist in Australia today. In fact, painting only turns up in 9 of the artists or groups selected. - there's also installations, films, sculpture, photos and performances. I except Kylie Banyard's utopian tribute to Black Mountain College in the US from these doubts – but can't refrain from naming the T/homs – Polo and Roberts. But then, pace the current ANU Drill Hall catalogue discussion regarding the wonderful Hassall Collection show, perhaps non-Indigenous painters are choosing to emulate the untrained artists of remote Aboriginal communities, where the vibrancy, the energy of the relationship between paint, brush and canvas is more important than technical skills in the passion with which they communicate their stories visually? I'll be expanding upon that thesis soon. But back to the MCA – where sisters Sonia Kurrara and Daisy Japulitja have joined forces with Nada Rawlins and the late Mrs Uhl to play with graffiti pens on huge perspex sheets. Nothing daunts those ladies. Give them a cowhide (as in 'Desert River Sea' in Perth) or three metres of perspex and they'll tackle it. Both the riverine and desert cultures of Fitzroy Crossing find their space. And their gorgeous colours sit in a room with Eugenia Lim's canary yellow tent – it's an optic explosion. A corridor full of Kaylene Whiskey's American pop culture imagery is almost enough to make you take flight like Super Anangu and Super Kungka – her self-identified heroines, who can rescue Michael Jackson from sharks with deadly underwater boomerangs (though Jackson needs more than that at the moment!) or snap Dolly Parton's photo to bring back to Indulkana to be heroine-worshipped. This is Clothilde Bullen's Third Space in one artist. Meanwhile, two others of the younger Indigenous generation – Ishmael Marika and Curtis Taylor – show that being from opposite sides of the country doesn't deny the possibility of collaboration. The Yolngu Marika reveals his technical mastery by projecting computer images of a variety of local designs on to a small forest of larrikitj poles. And I suspect Taylor is borrowing from the NATSIAA-winning film by Marika's fellow Yolngu, Petrina Mununggurr. For she showed herself mining, grinding and smearing white ochre on her forehead in a meditative way, preparing for ceremony. Taylor shows a man's back being calmly scarified in the traditional manner – a tough way to reveal your tribal authority. At the Art Gallery of NSW – where curator Isobel Parker Philip declared that her selected artists were the canaries in the coal mine, capturing the anxiety and anticipation of our contemporary world – the Indigenous star was surely Sally Nangala Mulda in a basement full of irony about life in the town camps around Alice Springs. This big, laughing Aranda woman (I've never yet heard anyone call themselves Arrernte, as we're told to!) sees a lot of drinking, a lot of police action and has a lot of sympathy for both sides. 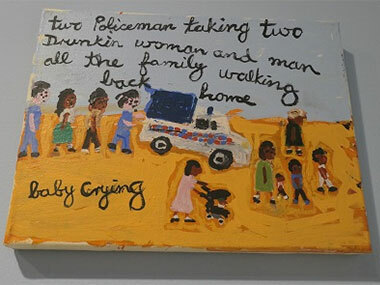 My favourite has a family walking disconsolately behind the cop van where their drunker parents are being taken away – the baby crying so vociferously that Mulda has captured her pram physically shaking. She's also essayed some purely text works on the same themes. 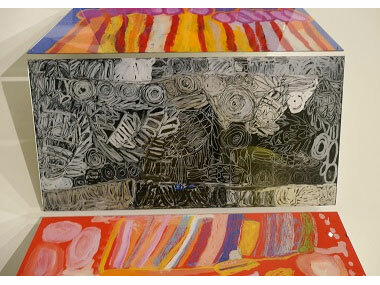 A group of her fellow Centralians have experimented with lumen prints on aluminium, so that familiar Hermannsburg watercolours are presented surrounded by objects from the landscape they picture. These leaves, roots, etc, many of which have medicinal value – were captured using only sunlight on a photo-sensitive surface – now sit on a pink background. I might argue that this isn't a colour which really enhances the delicate tones of the watercolours. But it seems to be part of some facilitator's project to suggest that Rex Batterbee's photos of his time working with Albert Namatjira may actually have been taken by Albert himself. Do the artists care, I wonder? And then there's Yawura conceptualist, Robert Andrew. Despite being a West Australian, he's paying tribute to his NSW brothers by constructing a machine which will eventually create the Gadigal word 'Buduwa' on a wall over the course of the exhibition. Currently, only a few blips have emerged. There are also towers of compacted earth that machinery will eventually pull apart to prove that Indigenous culture is ever capable of change. Personally, I saw more insight into the generous breadth of the Indigenous mind in the unchanged meaning of 'Buduwa' – “Warming your hands by the fire and squeezing another's fingers”. Pure, humanist poetry. I suspect few will head for the third venue, Carriageworks for its Indigenous content. The prominent name, Tony Albert, has taken a very easy option in getting someone else to construct an outsize 3D triangle of steel sheets coloured, provocatively, black and white. None of his familiar kitsch – all the work is to be done by us. Thank heavens, therefore for Amala Groom. This Wiradjuri woman has filmed herself in the colonialist's white wedding dress but set her story on her own tribal bush Country – which you can almost smell. She's veiled and almost blindly following a contorted line of red thread through the bush until she reaches its umbilical end. To a chorus of triumphalist birds, she throws back the veil and runs free of colonial impositions into her own karma. Perhaps Carriageworks' (and curator Daniel Mudie Cunningham's) strength lies in works by artists such as Eric Bridgeman, Tara Marynowsky, Sean Rafferty and Melanie Jame Wolf? Two films that held my attention and two huge wall works. At the MCA, Teo Treloar stood out; and at the Art Gallery, Lucas Abela and the very serious young Kurdish refugee, Rushidi Anwar were my pick.